That's not me, it's Chris, but you get the idea. 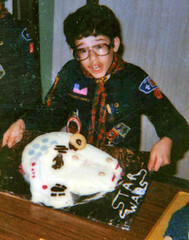 There was an early experience in first grade when the makings of a geek made an appearance. Somehow, I had managed to perfect the art of making papier-mâché frogs faster (and at higher quality) than anyone else in the class, including the teacher. The teacher then had me demonstrating for the entire class how to make this particular craftwork. How I perfected the art shall remain my trade secret, but what’s important is little did I know that the path I had set out upon because of that single activity would take me to where I am at today. From that incident, I learned that I was capable of doing things no one else could, or in cases such as papier-mâché frogs, what no one else sanely wanted to do. “It has been described as internet dating for inventors” – well, here at Mendeley we didn’t know that we were doing this kind of stuff, but in any case it’s fantastic news that yesterday Channel 4 News, one of UK’s leading news channels, reported about Mendeley! The six minute report names James Dyson, probably Britain’s most famous inventor, and Mendeley as exemplary innovators in UK’s recovering economy. Besides showing Mendeley in our “tiny office in London” (oh well, start-up life…), Channel 4 News also interviewed Cameron Neylon in front of his mega-super-duper-luxurious four monitor set-up. Thanks Cameron for the nice quotes! Here’s the write-up and below you will find the video. “It has been described as internet dating for inventors” – well, here at Mendeley we didn’t know that we were doing this kind of stuff, but in any case it’s fantastic news that yesterday Benjamin Cohen from Channel 4 News, one of the UK’s leading news channels, reported on Mendeley! The three minute report names James Dyson, probably Britain’s most famous inventor, and Mendeley as exemplary innovators in the UK’s recovering economy. Besides showing Mendeley in our “tiny office in London” (oh well, start-up life…), Channel 4 News also interviewed Dr. Cameron Neylon, Molecular Biologist at the Science and Technologies Facilities Council, and an Open Science advocate, in front of his mega-super-duper-luxurious four monitor set-up. Thanks Cameron for the nice quotes! Here’s the write-up, the link to the video, and below you will find the video embedded. What’s relevant to me….right now? Above is an image from a talk that I gave earlier this year. As you can see, if I lived decades ago, I could somewhat keep up with all new research that pertained to me. Today though? Forget about it. There is just way too much going on. Even if I consider myself to be in a niche research field, I should still be keeping up with cross-disciplinary material that is relevant to my research. There is just no way to keep up with all of that information. It is information overload.